As part of the Stage 2 Bike Installation Project, 40 racks will be built at 24 locations, including outside Lido restaurant on William Street in Northbridge, Source Foods on the corner of Brisbane and Beaufort streets in Perth, North Perth Post Office and Re Store on Oxford Street in Leederville. Bicycling Western Australia chief executive Jeremey Murray said the key to encouraging people to cycle was adequate ‘end-of-trip’ facilities. ‘We are very pleased that councillors have been proactive and they will see an increase in people riding,’ he said. ‘One of the reasons people don’t cycle more is because they have nowhere to put their bikes when they get to their end destination. Vincent Mayor Alannah MacTiernan said community consultation determined the rack locations. ‘This project recognises there are lots of people that are riding,’ she said. ‘We know that we can’t provide all the car parking spaces people want so if we can effectively offer more convenient and interesting bike racks, then people that do ride are more likely to bring their bikes. 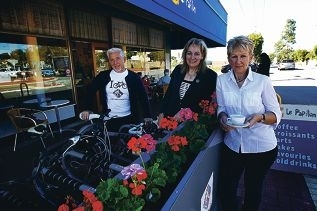 Stage 1 locations include outside Le Papillon patisserie in Perth, which has an innovative six-bike planter rack with flowers, Dizzy Witch in Perth and Weld Square in Highgate. Both projects should be completed by July.